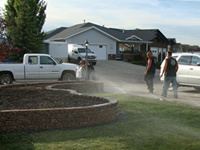 Over The Edge Landscaping has been in business since 2001; when we were a BBEX finalist. We believe in giving back to our community by supporting the CU-plex with a $2,500 donation. We have worked with SaskTel, SaskPower and SaskEnergy, and we work with many clients to provide them with many years of pleasurable enjoyment of their beautiful properties. We have diversified over the years to become what we are today. 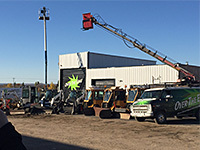 We have every piece of equipment you could think of. Edwin Smockum Owner / General Manager. I have completed and received instructor awards for the small business and entrepreneurship class. 11 years experience fully insured and claims free in 11 years on WCB and liability. My foreman has been around the company for 6 years.